Magnolia opens with three stories: One about a resident of Greenberry Hill in London being murdered by Joseph Green, Stanley Berry and Daniel Hill; another about a scuba diver killed by a firefighting airplane, and the fact that the scuba diver actually encountered the pilot of the plane a few days before; and finally a 17-year-old attempting suicide by jumping off the roof of his apartment building, only to have his mother accidentally shoot him as he falls past her window. What do all of these stories have in common? They're all a matter of coincidence. So what does this have to do with a mosaic of stories about a police officer who lost his gun (John C. Reilly); a dying TV producer (Jason Robards), his mentally unstable trophy wife (Julianne Moore) and his lonely but kind nurse (Philip Seymour Hoffman); a Cocaine addict (Melora Walters) and her fractured relationship with her quiz show host father (Philip Baker Hall); a misogynistic man (Tom Cruise) who endorses 'Seduce and Destroy', which allows men to get their way with women easily; a former quiz champion who apparently needs braces (William H. Macy); and a young intelligent boy (Jeremy Blackman) afraid of disappointing his father? Well, for most of the film, it would appear that these stories are just thrown together into one film, holding little resemblance or connection to one another. But what writer/director Paul Thomas Anderson wants us to realise is the fact that there are a lot more connections between one life and another that comes down to pure coincidence. In three hours, Anderson does everything he possibly can to get his point across, and there is definitely no other way that the point could have been achieved. First, he uses a lot of examples just to show how widespread coincidence can go. Since he used a lot of examples, he does everything in his power to make sure that his many characters don't succumb to two-dimensionality. And guess what? They don't. Every character is carefully crafted, so it is a lot easier to believe in them all, and stay with each of them throughout the whole time. When Anderson gets to his point, its glorious. An unlikely event allows all of these characters to save themselves in some small way, and it's beautiful to watch. The fact that Paul Thomas Anderson made this film three hours for a potentially mainstream audience is a bit of a stretch. But it also shows that Anderson may in fact be one of the most talented modern writers/directors around. Magnolia is nothing short of epic, and it also remains completely engaging for the entire running time. It's also a film that requires multiple viewings, as there will always be something new to discover. I had to watch it twice to entirely get the gist of it, but had I had the chance, I'd have watched it a few more times. On the second time around, I realised how much attention to detail Anderson gave. It's ridiculous the amounts of times the numbers 8 and 2 show up, because of the many references to Exodus 8:2 which gives this movie most of its meaning. Also, on a second watch, many of the themes in the movie became a lot clearer to me. Other than the theme of coincidence, the one theme I was most impressed with was that mistakes from the past cannot simply be erased. A lot of movies that deal with forgiveness always make sure that once a person is forgiven nothing else matters. 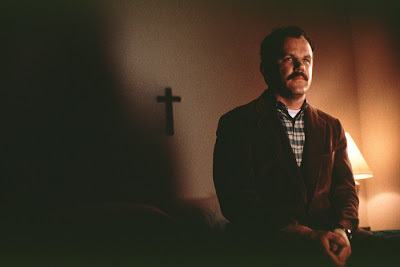 This movie, however, realises that forgiveness is generally a good thing, but the past never really goes away. I think this was probably most evident in Frank (Cruise) and Earl's (Robards) story, but it could be found in just about any of the others. Being a multi-plot film with several stories and well-built characters, a strong cast was needed. Anderson got nothing less. If I had to choose two of my favourite performances in the movie, I'd probably go with Tom Cruise and Julianne Moore. 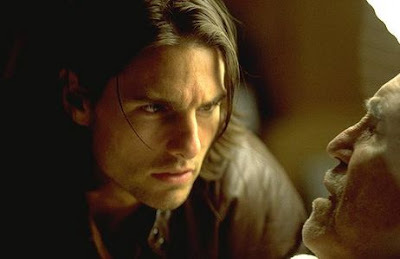 Now, for some reason, I've always pictured Cruise as someone who often plays the nice guy. Here, he is the complete opposite. He offended the crap out of me while he was trying to sell his 'Seduce and Destroy' book, as he looked like he didn't have any respect for women at all. 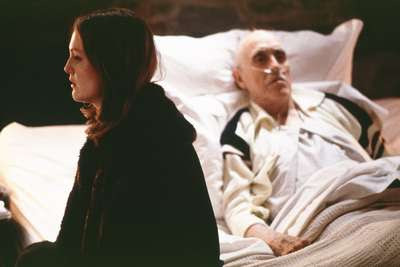 But I'll always remember him sitting by his dying father's bed, refusing to cry...and there, the man is changed. Julianne Moore has always been one of my favourite actresses, and I really liked her performance here even though her character was pretty shaky and crazy. The scene where she breaks down in the pharmacy was quite memorable. The film is filled with many brilliant performances, whether it be from a calm Philip Seymour Hoffman, a bed-ridden Jason Robards, an on-edge Melora Walters, a smitten John C. Reilly or an insecure William H. Macy...everyone is brilliant, which I think is a rarity in multi-plot films as actors are usually never given the chance to shine as much as they do here. Providing a lovely final touch is Jon Brion's brilliant score and the heavy influence from Aimee Mann's music. The song opens with her cover of the song 'One' by Harry Nilsson, which is perfect for all of the characters introductions. Also, a song of hers, 'Wise Up', was at one point sung by each of the characters in the middle of the film. I felt that this sequence was a little bit indulgent on Anderson's part, but hey, not every film can be perfect, right? As a character study, though, this film gets pretty damn near to perfection. 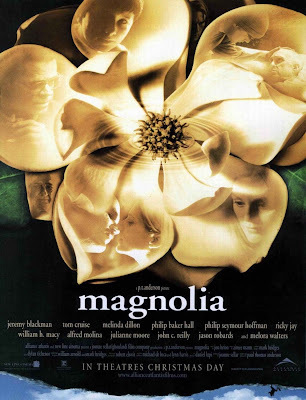 THE VERDICT: Paul Thomas Anderson may just be one of the best writer/directors out there, as Magnolia clearly shows. It's an epic drama that is engaging through its entire three hour running time, and has enough material to last over several watches. i dunno stevee, you make a lot of very good points but i just can't bring myself to see this one again. I know lots of people who hate on this and - as usual with those who hate on something - they're incredibly vocal about. Still, this remains one of my Top 100 films of all time, and I agree you with you wholeheartedly. I think people tend to try and simplify this movie to the point of voiding its point entirely. Now I really want to watch this film, it sounds so good! I've always heard a lot of great things about it, and that cast sounds pretty awesome - particularly Moore and Seymour Hoffman. And Paul Thomas Anderson, I've loved everything that he did so far (that I've watched, of course) so this one should be no exception. I can't help but grin at films I saw during their theatrical run being called "classics" - man am I ever getting old fast! Really interested to see how much you loved this film, since it's one of my all-time faves but one that many people I know detest. Guess one's appreciation of it all comes down to one's love for sprawling character pieces. I also really love talking to people to find out which characters they gravitate to the most...since it seems like no two people attach to the same characters (for my money, Quiz Kid Donnie Smith and Phil the hospice worker. If you dug on this, I suggest you start sifting through the films of Robert Altman, as they are a heavy influence on P.T. Anderson. Great post Stevee - keep 'em coming! I was engaged the whole time, and was in love with Cruise's performance the most but my only problem was that the refrences to the bible came a little bit too much for me, and just seemed a little preachy in a way. Good Review! Love this film. It's one of my favorites and a perfect example of how a longer running time can be fascinating, even on repeat viewings. Great post! This is the most perplexing film I have ever seen. While I am engaged to the point of no return, it's too much for me. And that climax...I have never been that freaked out by a climax. Glad you enjoyed it. This is a great review, Stevee. Believe it or not, I never actually posted a review of this because I never felt I needed to, but there is so much I've picked up from this movie from the 20-odd times I've seen it. I don't like to label a single film my favourite of all time, but when I really think about it, it has to be Magnolia. Toby - Ha, I'm the complete opposite. I want to watch it a few more times! Univarn - Gosh, I hate people who hate on stuff and are incredibly vocal about it. I think it's just a case of not getting what the movie is trying to say...which is kinda sad. Maria Sofia - If you liked Paul Thomas Anderson's other work then I would definitely check this out. I like this one the most. The cast is pretty awesome, too! Ryan - Haha, you're not getting old...I'm just young! I wouldn't know which character I'd connect with the most. Probably Phil...he's a really nice guy. I'll definitely check out some Altman next. Thanks! Dan O. - I totally agree! Even with the preachy part, I don't usually like movies with a lot of bible references. Thanks! Dan Heaton - It sure can! Thanks! Nikhat - It got a little too much for me, too. That was the first time, though. Tyler - I was so nervous while writing this review because you have watched it so many times and love it so much. I reckon it's hard to write a review on a film that I consider a favourite - my reviews on the likes of Memento and Schindler's List came a bit before I decided that they were my favourites! I don't quite LOVE this one, 1999 was such an auspicious cinema year I had more love to mete out to American Beauty, The Talented Mr. Ripley, Fight Club, Election, Sleepy Hollow and a few more BUT it's impossible to deny the goodness of the cast which is buoyed by the fine direction. Like most contemporary ensemble films (Except, Traffic that I can recall) there's a tendency for the issues to be handled in a bit of a heavy-handed way but it's a good film, no doubt. Andrew - 1999 was a very good year for cinema...if only I wasn't just four years old, I could have enjoyed it properly! Haha. It is a good film. Not perfect, but good. wilde.dash - Gosh, I couldn't imagine watching this film with anyone else. I'll probably revisit this in a few months/years time...I'm a big advocate, too!